Tapas are at the very heart of Spanish lifestyle and culture. Everywhere in Spain, you will find lively, noisy bars serving small plates of superb flavours and local delicacies. It is essentially a style of eating rather than a form of cooking. Tapas mean sociability, friends and family. The Spanish, in general, won't drink without eating something as well. Happy hour in Spain is not a half price drink hour. It's a time when you can have a free small tapa with every drink ordered. Not all bars participate in this modern custom but it is certainly becoming more popular. Many cuisines offer foods meant to awaken the appetite. Antipasti, hors d'oeuvres and mezes are among countless names of dishes typically eaten just before a meal. In some trendy restaurants they turn an assortment of small dishes into the main meal itself. In Spain, however, eating tapas is a separate dining experience. In fact, the term tapas and its various regional equivalents have come to imply the act of going out barhopping, or the art of eating while standing. After completing the first round of lively conversation and small plates, the group moves on to the next bar, often only footsteps away. There is no end to the variety of tapas available. Every village, town or city has their own variety of small bites of Spanish flavours. Some of these tapas are common to all districts. Even if the name is slightly different, the recipe will be the same. 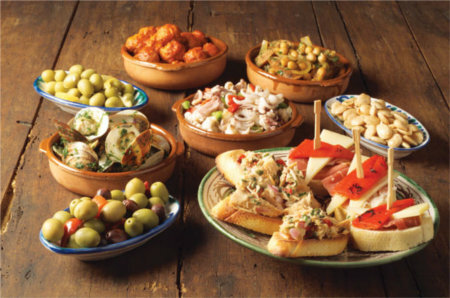 The word "tapas" is derived from the Spanish verb tapar, "to cover". Tapa means "lid" or "cover" in Spanish. * According to legend, the tapa tradition began when King Alfonso X was ill. During his illness he ate small dishes washed down by wine. He accredited this diet to his recovery and ordered that all taverns serve small snacks or tapas with their wine. * Another version is thin slices of Jamón Iberia were placed across the top of his wine glass, encouraging him to snack. Hence the tapa (cover). * Yet another version is King Alfonso stopped by a famous venta (inn) in windy Cadiz where he ordered a cup of sherry. The waiter covered the glass with a slice of cured ham to protect the sherry from the sand. The king, after drinking the wine and eating the ham, ordered another sherry "with the cover." * A commonly cited explanation is that an item, be it bread or a flat card, etc., would often be placed on top of a drink to protect it from fruit flies; at some point it became a habit to top this "cover" with a snack. * It is also commonly said that since one would be standing while eating in traditional Spanish bars, they would need to place their plates on top of their drinks in order to eat, therefore creating a cover. * Some believe that the name originated sometime around the 16th century when tavern owners found out that the strong taste and smell of mature cheese could help disguise that of bad wine, thus "covering" it. Whatever the source, tapas have since evolved through Spanish history by incorporating ingredients and influences from many different cultures and countries. The Romans invaded and introduced the Olive. The Moors invaded in the 8th century and brought almonds, citrus fruits and fragrant spices. The discovery of the New World brought the introduction of chili peppers, tomatoes, corn, beans and potatoes. All have combined to make tapas fun and exotic dishes with very few boundaries.